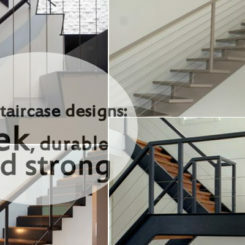 The staircase is an extremely important design element. 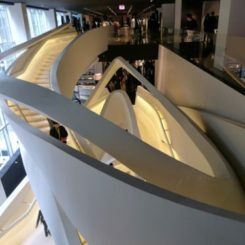 It’s always an eye-catching feature, whether it has a traditional design or an unusual shape.But we’re not going to talk about the usual staircase designs. 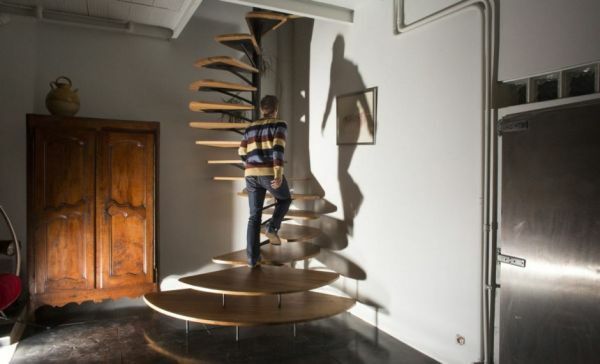 We want to show you some wonderful and very interesting and unconventional staircase designs. 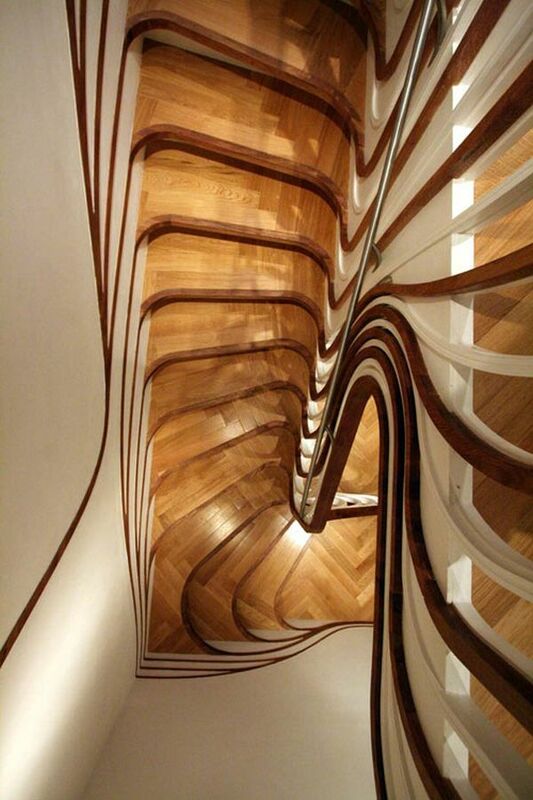 Let’s start with this great-looking staircase. 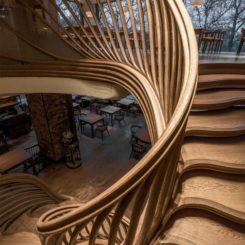 It’s made of wood so it matches the rest of the interior design and it has a spiraling shape. 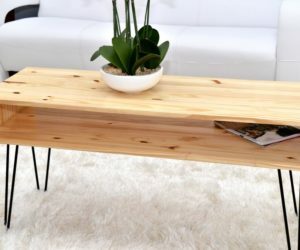 In a way it’s rustic and somewhat traditional but it’s also unusual. 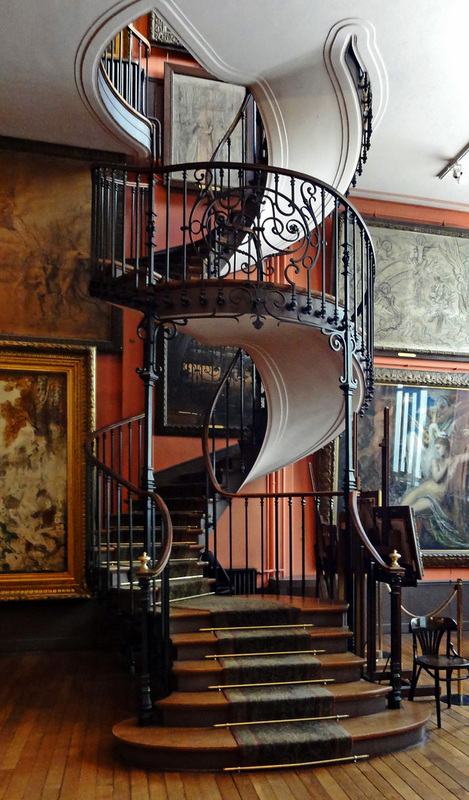 Marvelous design at the Musée Gustave Moreau. 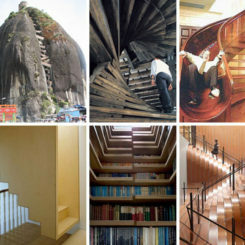 Some staircases are so beautiful they belong in a museum. 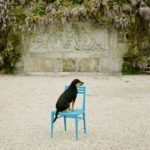 This one can be seen at Musee Gustave Moreau in Paris. It has an unforgettable design, sophisticated and very elegant. 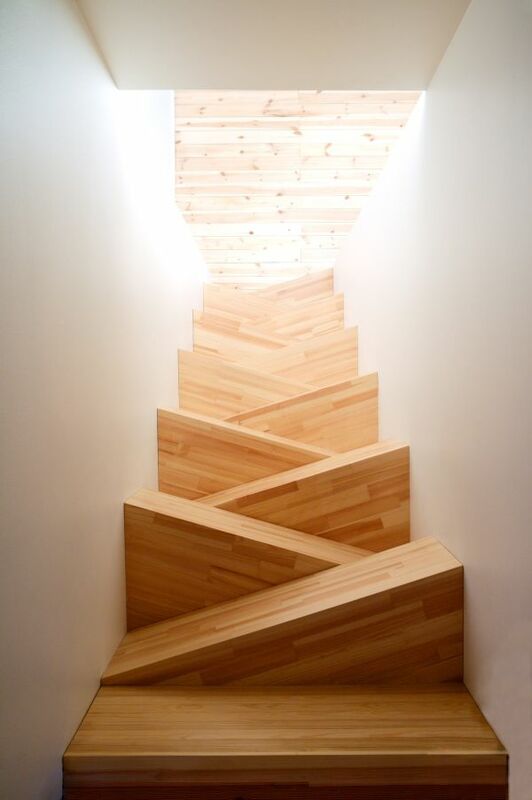 This is a staircase designed by Atmos Studio. 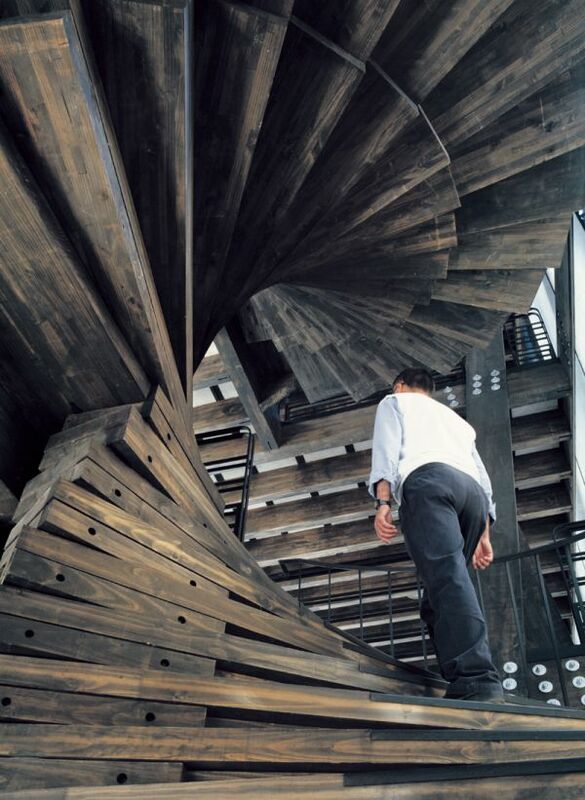 The stairs have a very unusual shape and they wind, twist and turn almost like they would if they were trying to came to life and to take over the place. 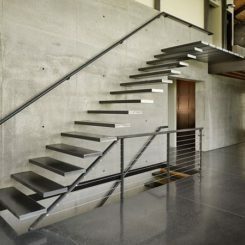 The staircase and the staircase walls are not just for support. 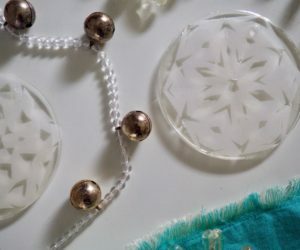 They can be ingeniously used for storage or for display. 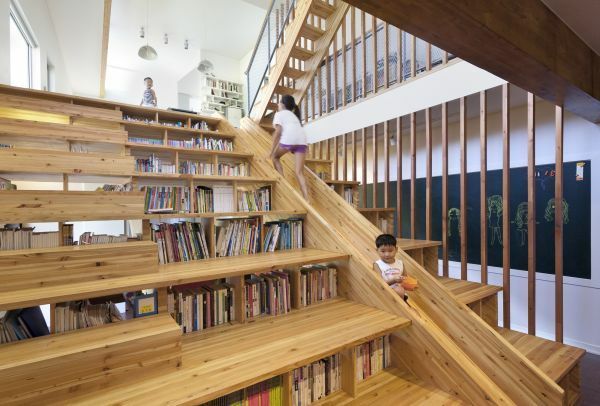 For example, this is an interesting combo between a staircase and a bookcase. 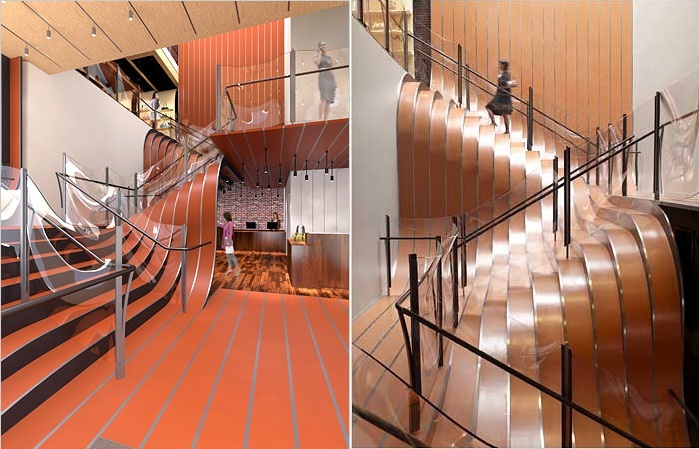 Modern designs often use unusual combinations of materials to create striking visual effects. 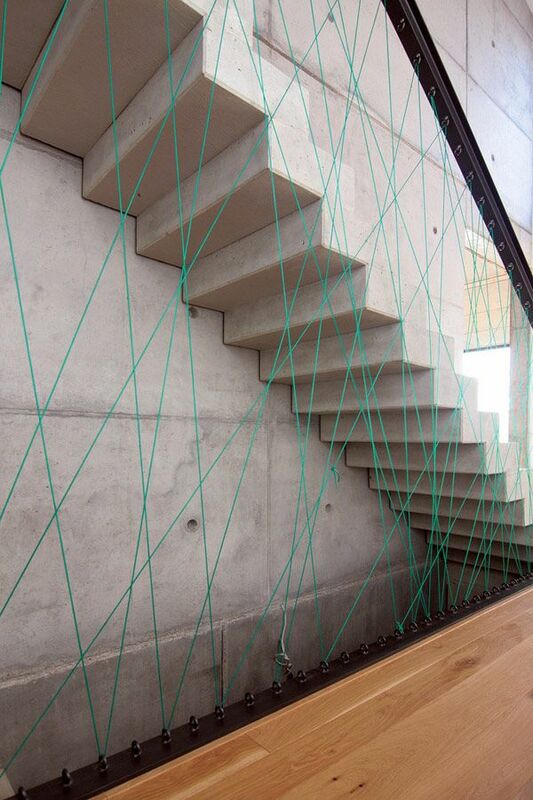 For example, this is a concrete staircase accessorized with a cord wall with a geometric design. 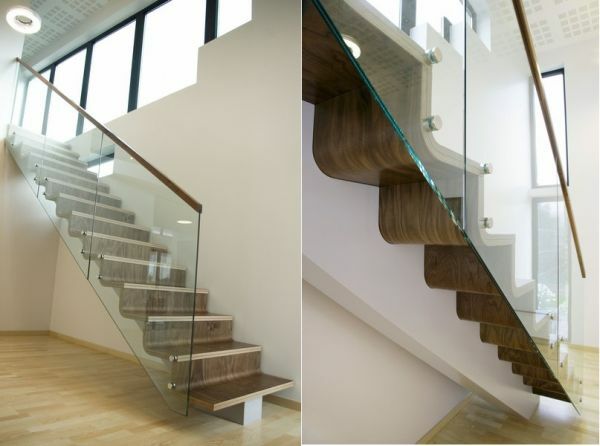 Floating staircases are a common choice in the case of modern and contemporary interior designs. 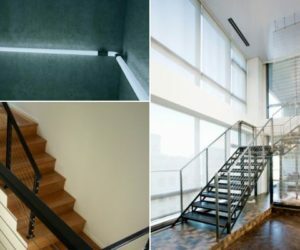 It’s a design which allows the décor to remain minimalist, open and airy without neglecting the functionality of the staircase. 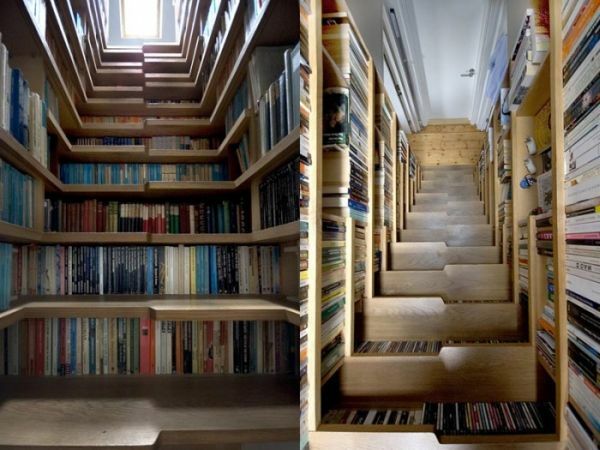 Whenever you need some extra storage space, try looking under the staircase. 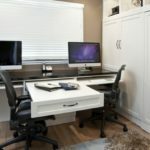 It’s an excellent spot for storing all sorts of items but commonly it’s a space used for storing and displaying books. 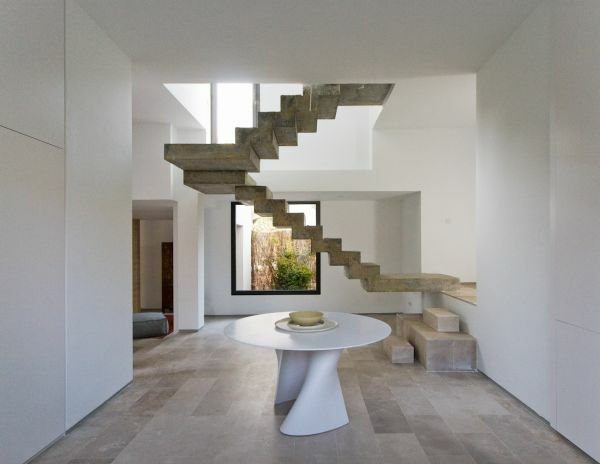 The geometric design of this staircase gives it a modern and minimalist vibe, especially given the color choice. 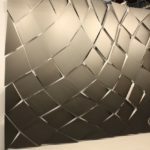 The shape is reminiscent of that of a ribbon, although the angles are not as smooth and delicate as expected. 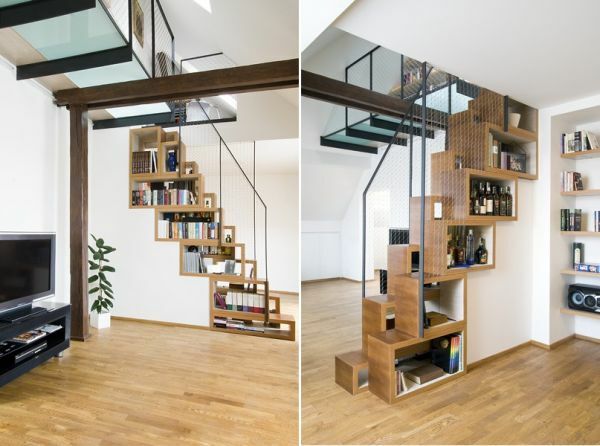 We’ve already mentioned that staircases are excellent for storing books but we what we didn;t say is that there are numerous ways of doing that.Here, for example, the staircase wall features wooden compartments for books, of different shapes and sizes. 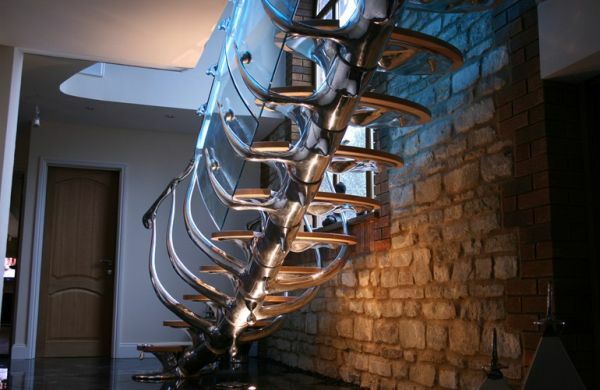 This striking staircase has a very unusual design. 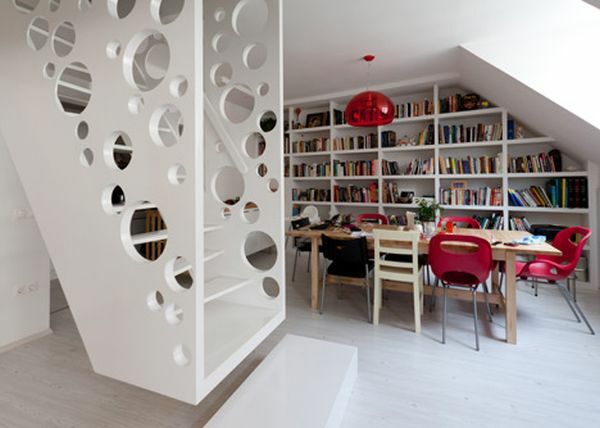 Although the structure is not unusual, the circular perforations in the staircase walls make it look like Swiss cheese. 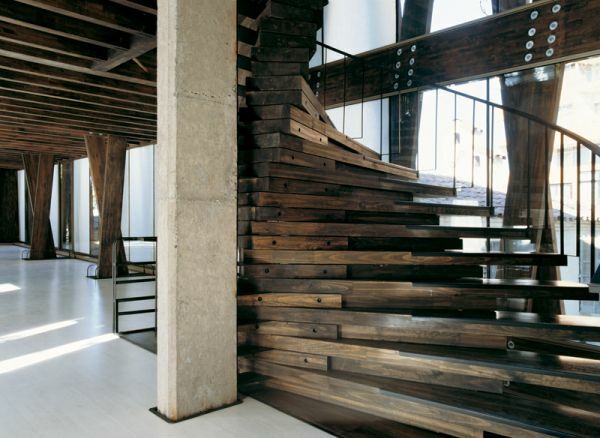 Usually, wooden staircases are not exactly graceful or sleek but they’re rather bulky and traditional-looking. 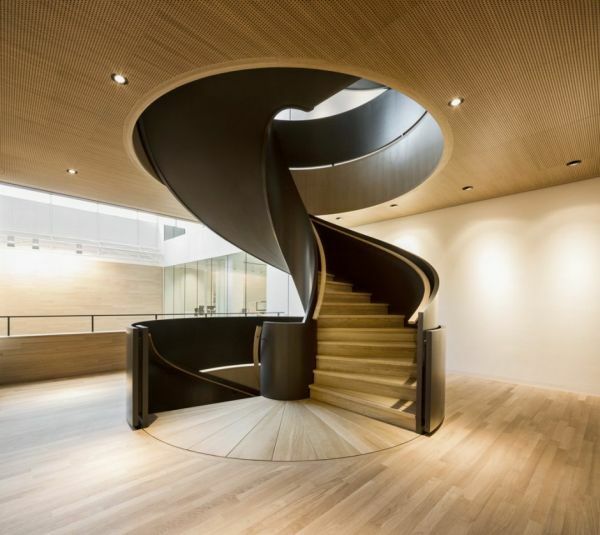 This staircase, however, has a very graceful design. 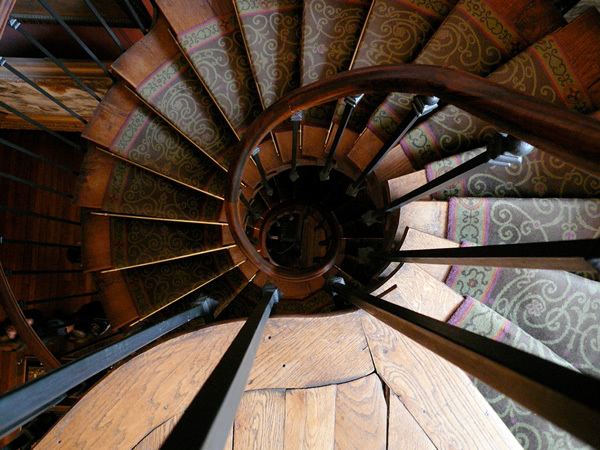 When seen from above, the staircase resembles a beautiful flower in bloom. 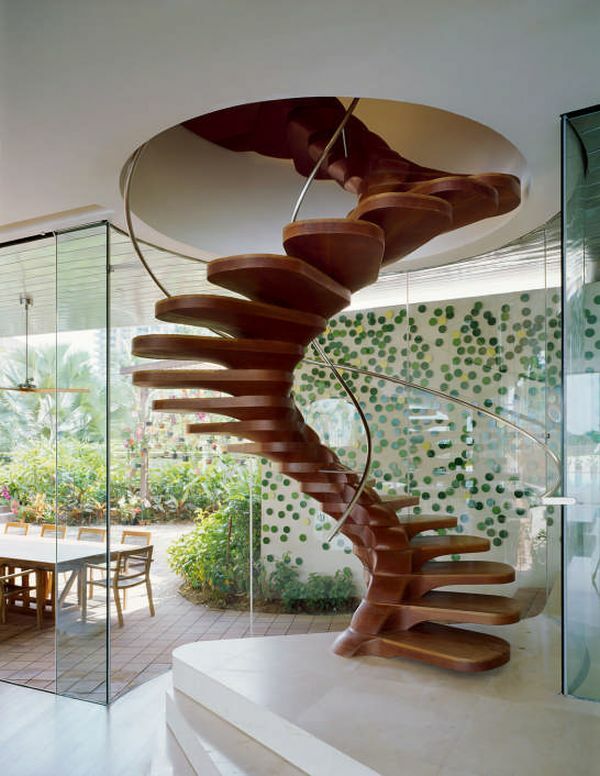 Here’s another example of a very graceful and very beautiful spiral staircase. 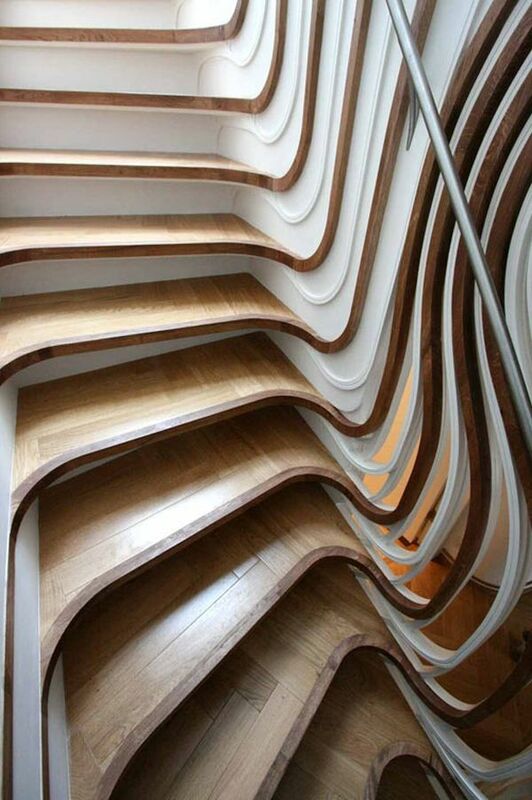 The steps are made of wood and they look like petals of a flower. They’re spiraling around a metal pole and smartly occupy the corner of the room. 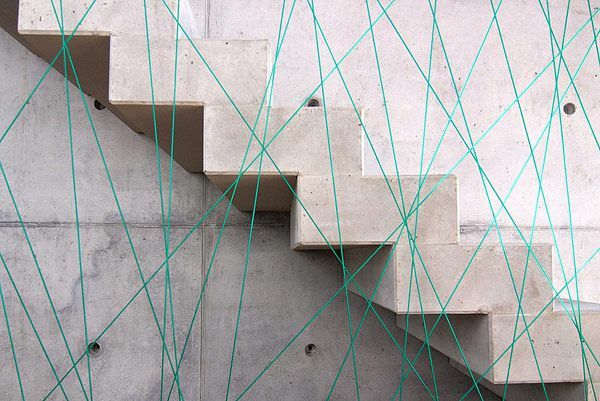 Designers experiment with all sorts of shapes when creating staircases. 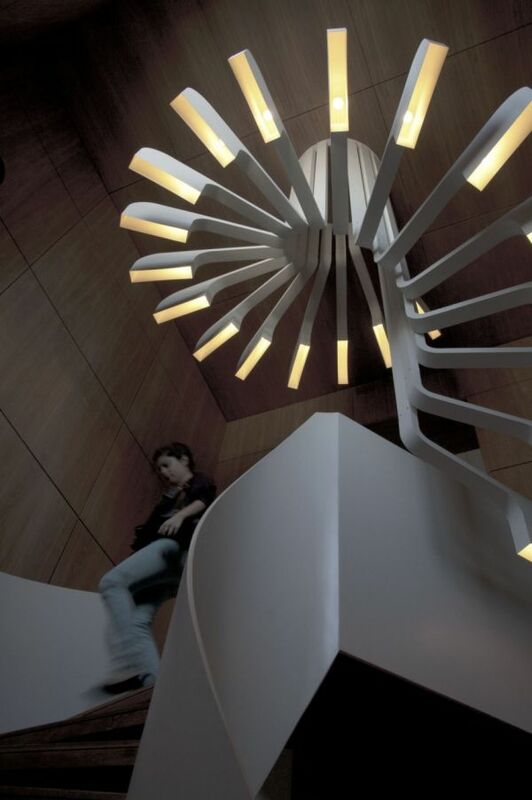 We’ve seen spiral staircase with steps that resemble petals and now it’s time to take a look at a staircase made of triangles. 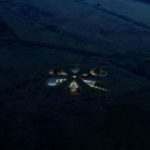 It’s an unusual design but it’s actually quite user-friendly. 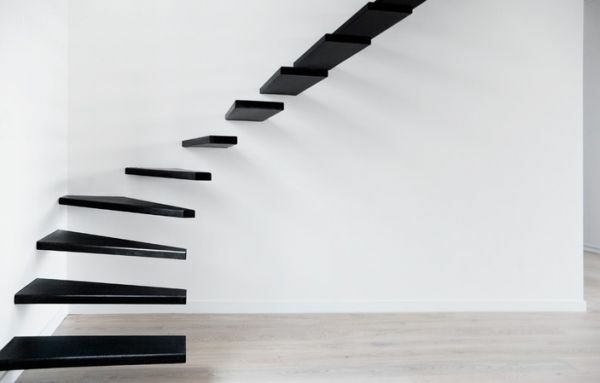 When designing floating staircases, wood and maybe metal are the most common choices. They’re rather lightweight and they’re also durable and strong. 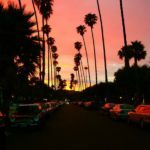 But concrete can be an option too. 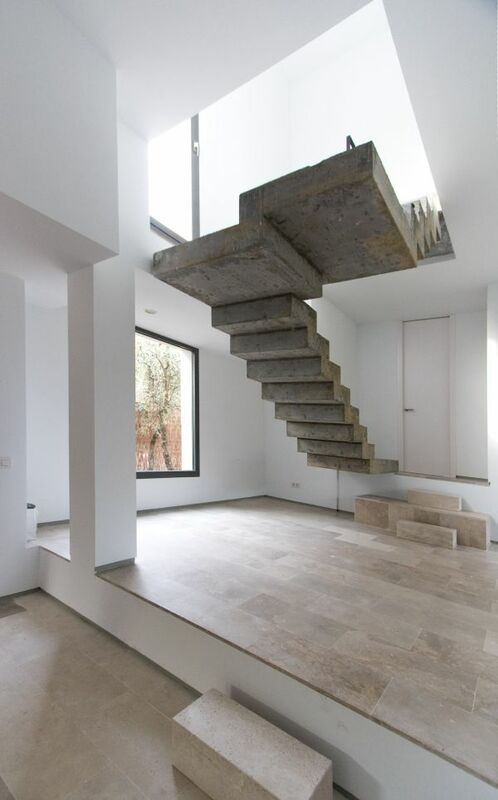 In fact, this floating concrete staircase makes quite a statement. This cast iron staircase has a very elegant and stylish design. The graceful lines and the combination of colors go hand in hand and form a harmonious design which complements the simple décor perfectly. 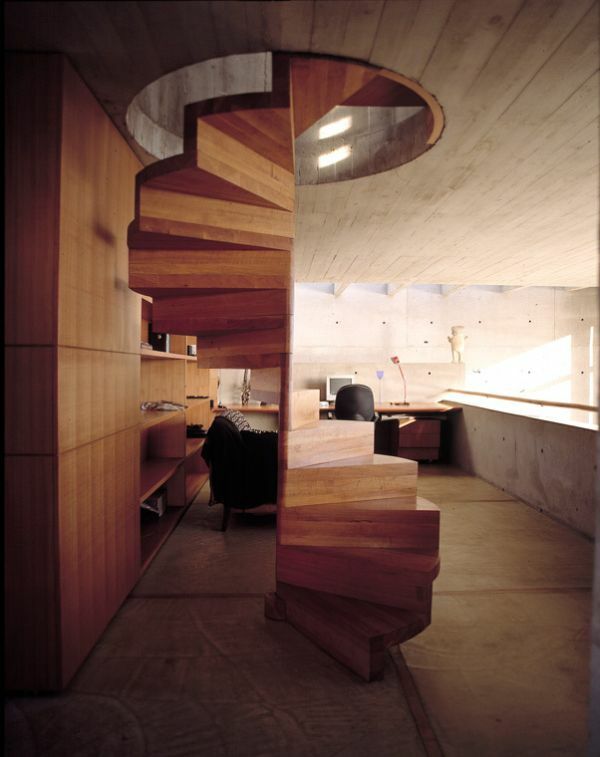 Wood and concrete – minimalist spiral. 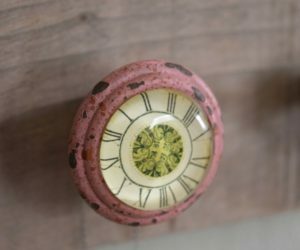 There are lots of ways in which you can turn a simple design into something eye-catching. 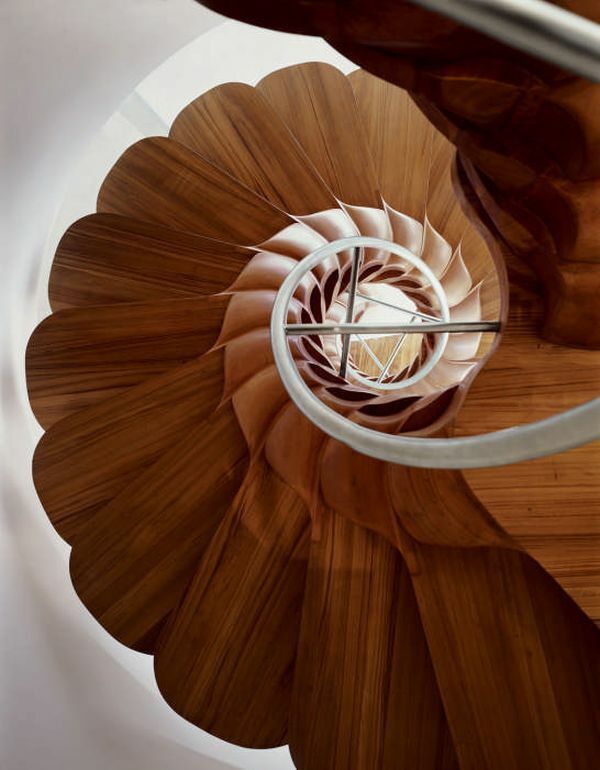 For example, this spiral staircase is very simple but it has a striking visual impact because of the geometry and the asymmetry. 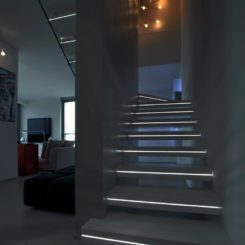 One way of making a design stand out is with mood-lighting. 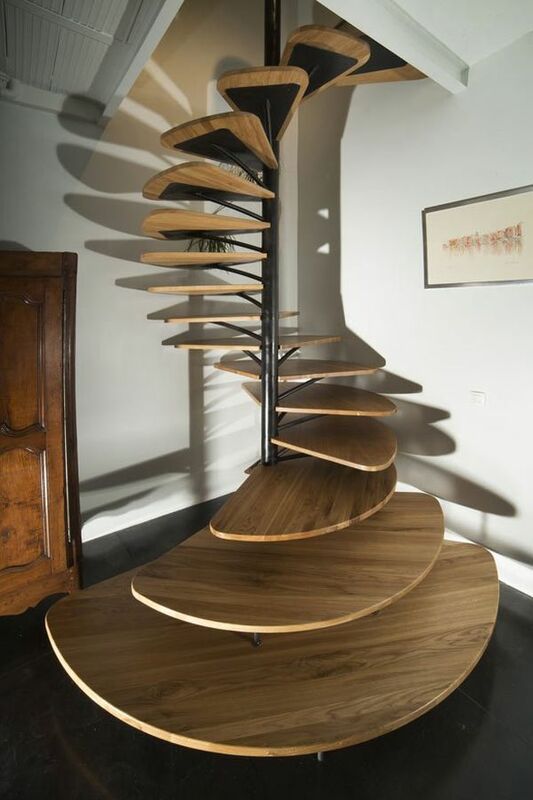 This spiral staircase is a perfect example of how something simple can transform an already beautiful design into something exceptional. 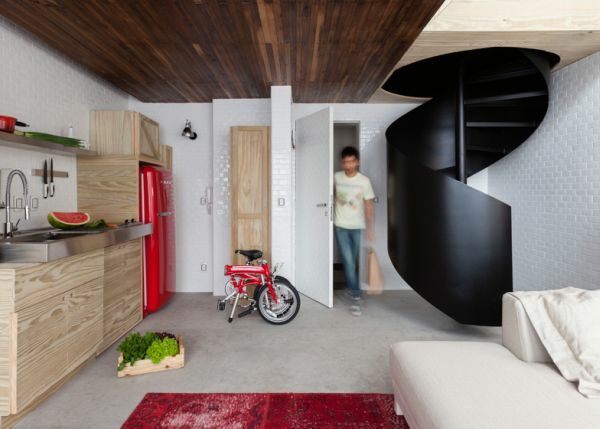 Spiral staircases are perfect for small space. They occupy very little floor space and they’re also not that intrusive. 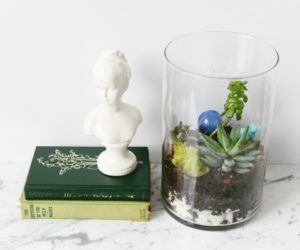 If placed in the corner of a room, they even more practical. 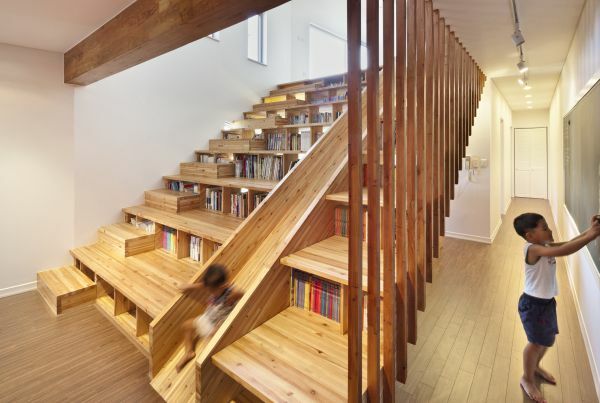 This staircase, for example, may seem robust but it takes up very little space. 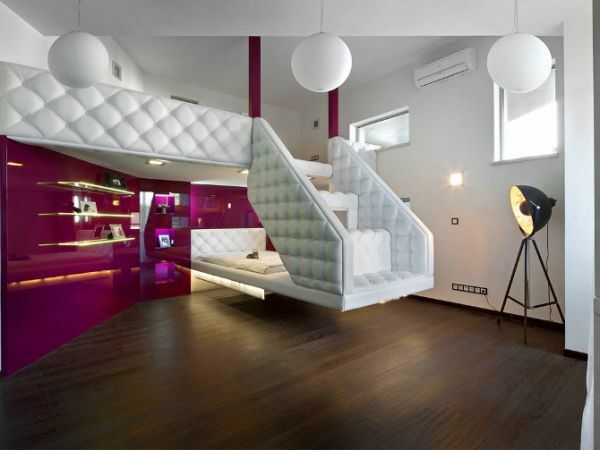 Why limit yourself to a design which only fulfills one function when you can have more? 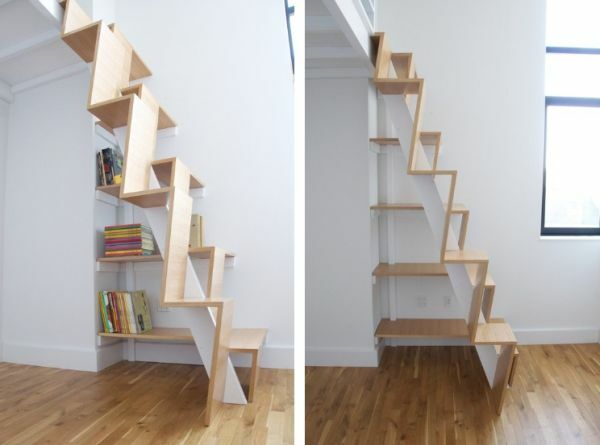 Staircases provide excellent storage space under the stairs and on the walls. 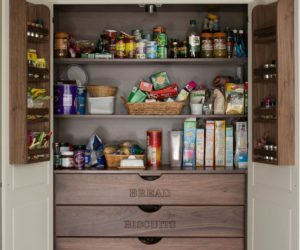 You can take advantage of that and maximize its functionality. 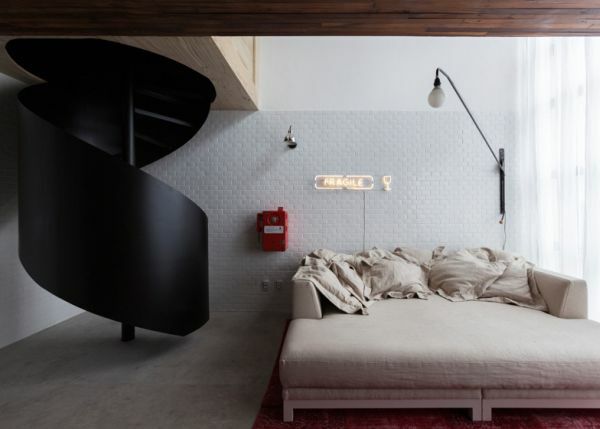 Staircases are usually nowhere near the bedroom but they can be part of the room if, for example, the bedroom is part of an open floor plan or if it has an upper level. 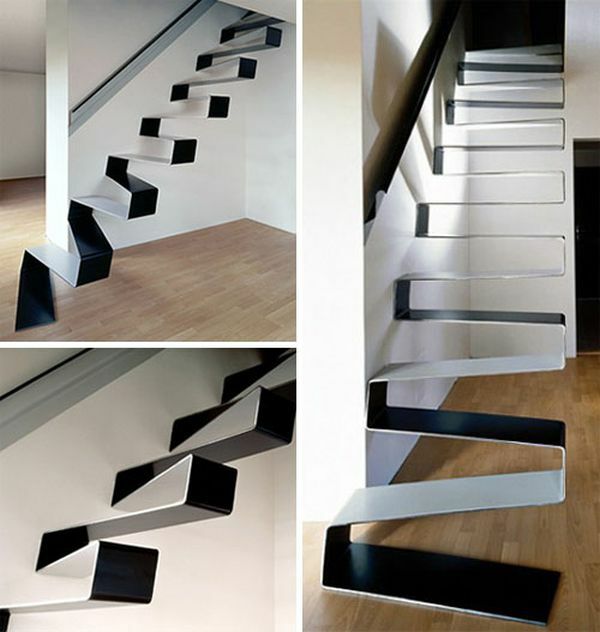 Instead of using aladder you can have a stylish staircase. 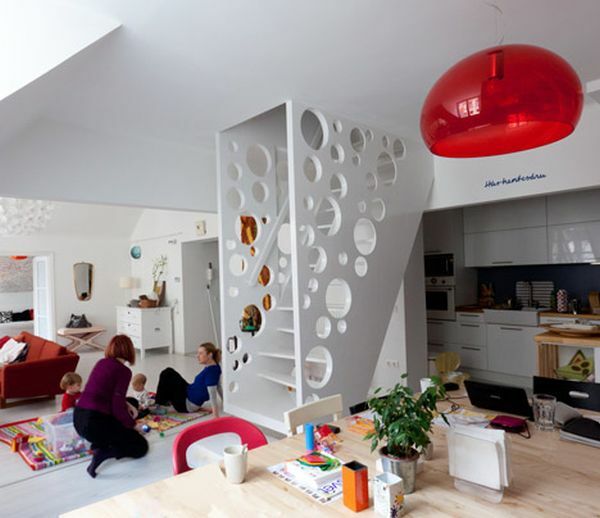 This stylish Norwegian staircase is unusual and eye-catching for several reasons. 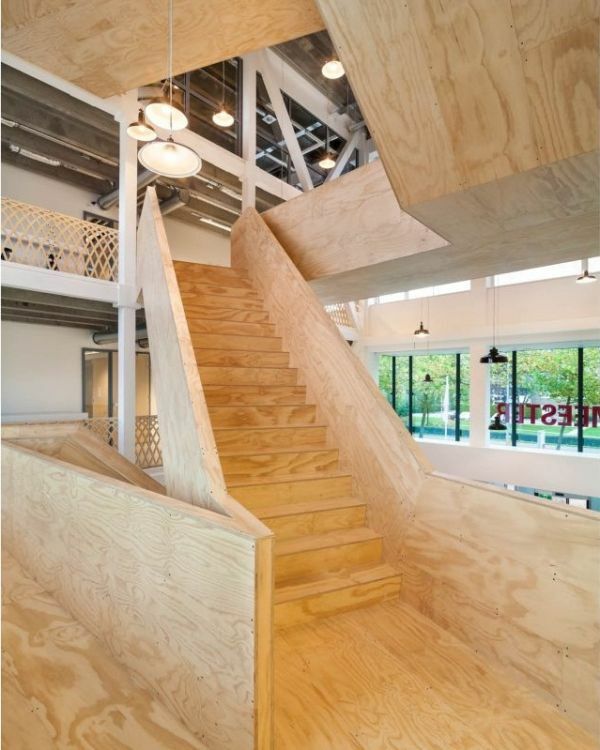 First of all, it has stairs made of timber and they’re…curved. 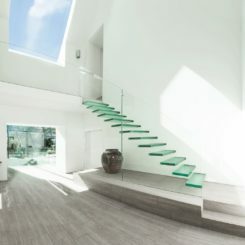 Also, the glass wall allows it to be admired from every angle. 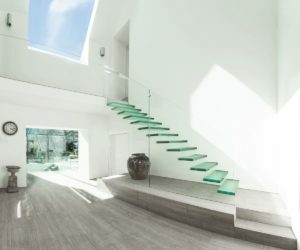 Some modern designs try to eliminate the staircase from their structures. 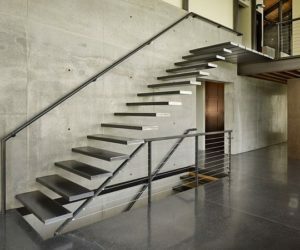 However, the staircase doesn’t completely disspear. 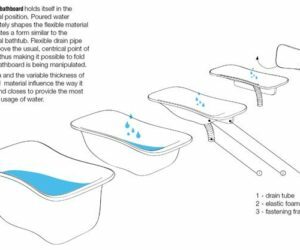 It’s simply incorporated into the wall and thus it becomes obtrusive but equally functional and eye-catching if not even more. 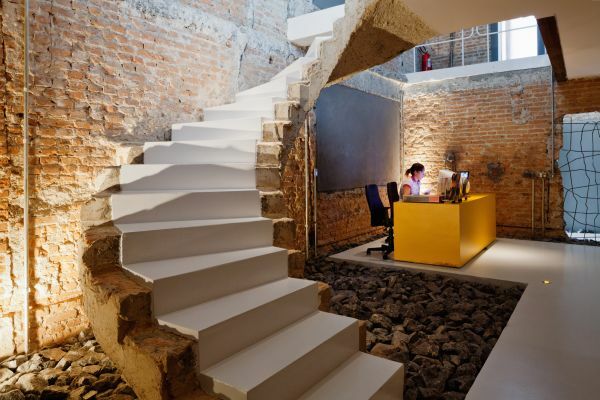 This staircase is very unusual for one reason: it looks like a giant spine and it looks like it’s melting. 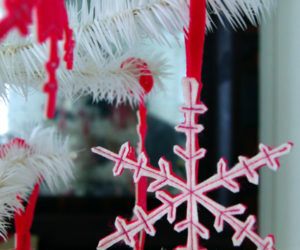 It’s just one of the many unique designs which use resemblances and correlations. 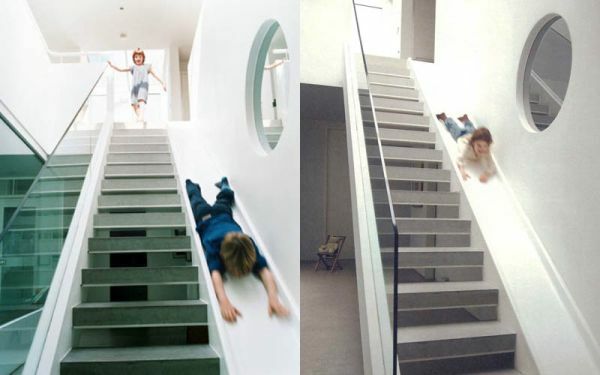 Sure, a staircase is a practical feature in a home but why not also make it fun for the kids? 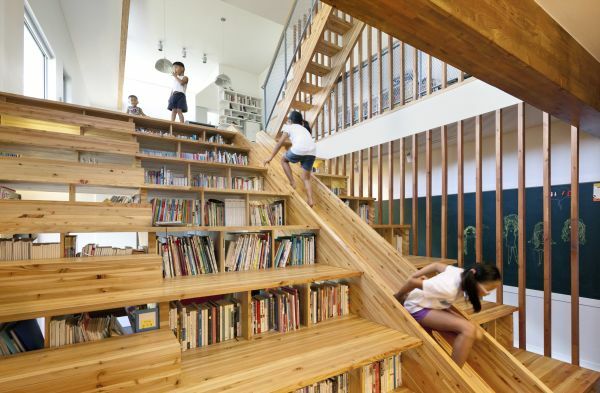 This is a staircase which also has a slide and it looks like the kids are having a blast using it. 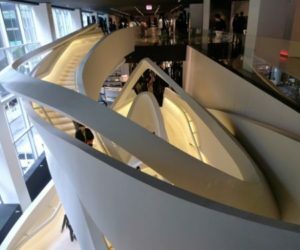 This unique staircase was designed for the Longchamp Store in New York City by Heatherwick Studio. 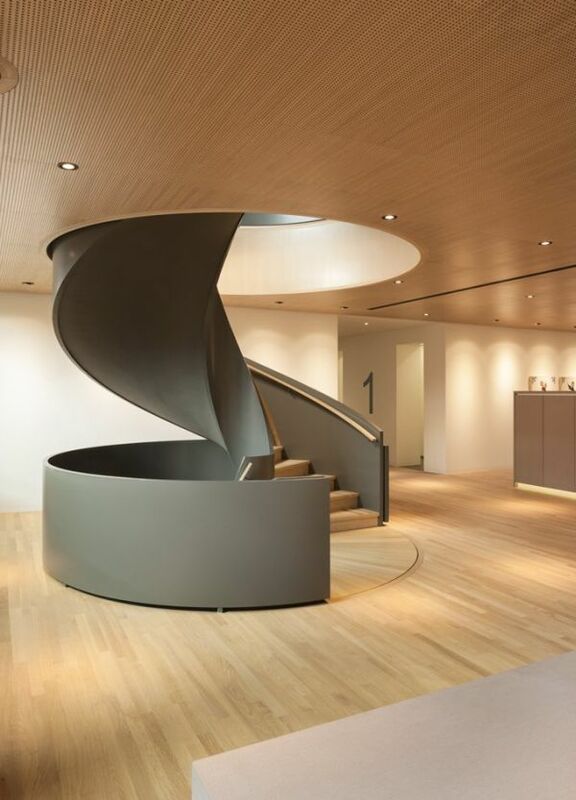 The stairs feature curved line and they appear to be integrated into the floor. They even seem to continue on the walls. 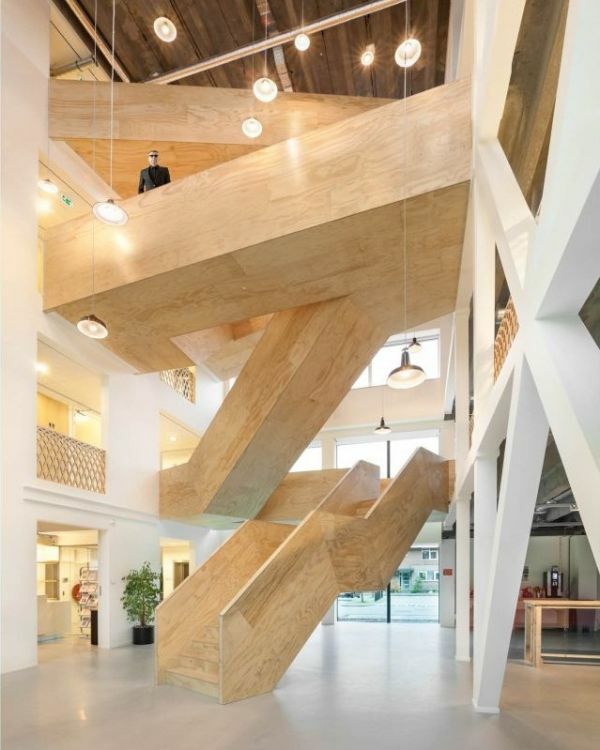 This building features a series of timber staircases which connect the different levels and the different functions. 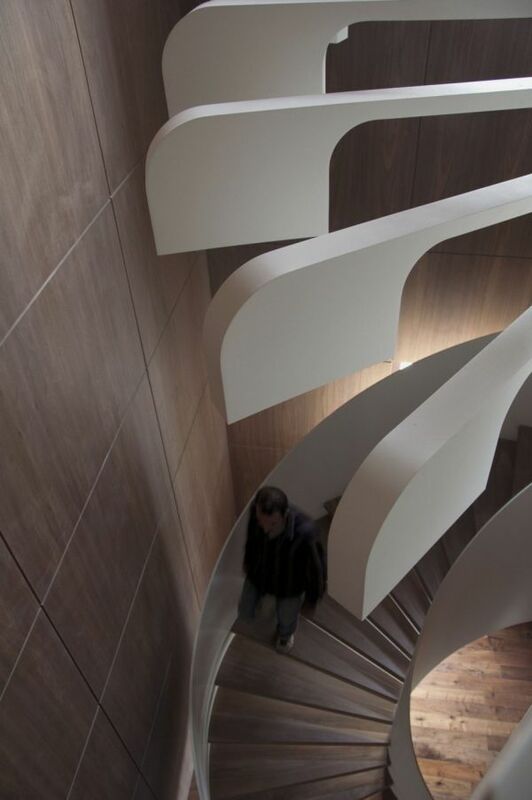 The staircases intersect and communicate and they have a very sculptural look. Mix of modern and old. 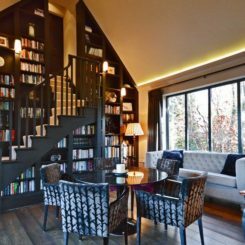 Some of the most interesting designs are those which use the contrast between styles such as this staircase which combines old and new elements and designs. 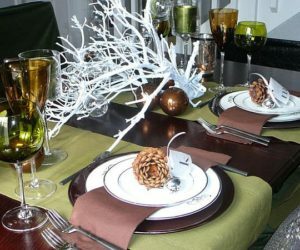 The combination of materials is also contrasting. 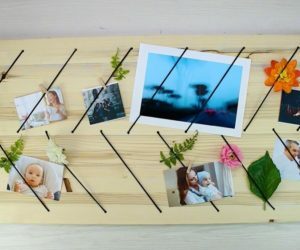 Project pictures: 1, 2, 3, 4, 5, 6, 7, 8, 9, 10, 11, 12, 13, 14, 15, 16, 17, 18, 19, 20, 21, 22, 23.